Intensive research has been directed at the discovery, biogenesis, and expression patterns of long noncoding RNAs , yet their biochemical functions have remained elusive for the most part. Nuclear receptors that interpret signaling mediated by small molecule hormones play a role in regulating the expression of some long noncoding RNAs. More importantly, these RNAs have also been shown to effect hormone-affected gene transcription regulated by the nuclear receptors. 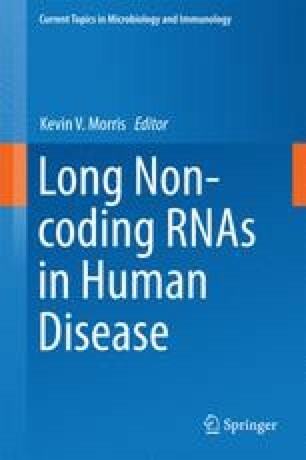 In this chapter, we summarize the current knowledge that has been acquired on hormonal signaling inducing expression of long noncoding RNAs and how they then may act in trans or in cis to modulate gene transcription. We highlight a few of these noncoding RNA molecules in terms of how they may impact hormone-driven cancers. Future directions critical for moving this field forward are presented, with a clear emphasis on the need for better biochemical approaches to address the mechanism of action of these exciting RNAs.